Well, the name should have been "the natural Angle flies". The aim with these Angle flies is to position and make them float in a natural right angle to the surface. 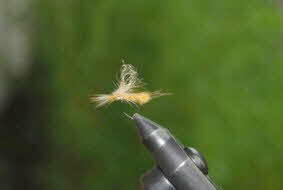 It's important that your fly ride natural right on the surface when presented; a lot of flies tilt over in many situations, giving undesirable imprint on the surface. I have used these flies for nearly two seasons now and must confess that they have never failed me when imitating mayflies for selective trout and grayling. 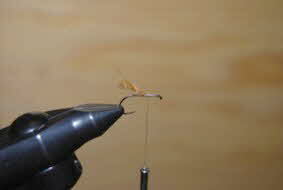 I do most of my dry fly fishing in the rivers Glomma and Rena. Especially in the latter, big trout here can be very difficult and selective. I tie the flies in different colures and sizes of course, but find that the success has more to do with the fact that these flies land in a perfect natural upright position almost every time. They also make a natural imprint on the surface, just like the real mayflies. Imitations of the Aurivilli and Ignita, have given me superb dry fly fishing on frequent occasions lately; occasions when other fly fishermen tear their hair in frustration. My solution is to leave most of the hook shank bare and use this to make "a gravity point" to land the fly in an upright position on the surface. I use one cdc feather and hold it between forefinger an thumb on each hand; then twitch the feather and double it to make back body of the fly. 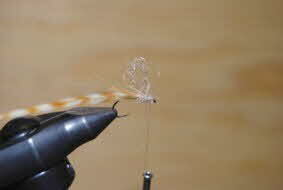 Also raise this section in an angle up-ward using the tying silk. 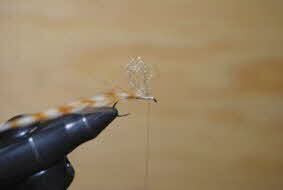 Tie in the loop wing; pull some of the fibres, after making the loop, to “fill” the loop by making some narrower loops. Use fibres from what’s left of the cdc, rip the fibres off the feather, and make a “ball” around the base of the wing with this dubbing. I also use my method for hackling the flies; a variation of parachute hackle, but were the hackle is winded in an angle to the hook shank. Wind the hackle cross; behind the wing at the base of the "ball" and down underneath the hook, in front of the tying tread, and cross up again 2 turns. 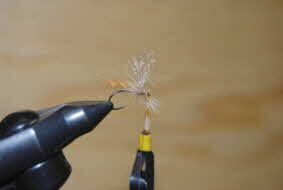 Tighten the tying silk when winding the hackle like this. Finish off and put on a drop of good head cement. Simple!